We hunt in the Diablo Mountains generally east of Hollister and south of Highway 152. We have miles and miles of trails and roads on an active cattle ranch where we will be the only hunters. If we see anyone else, it will be cowboys out doing their job. It is a very large property with a lot of varied terrain. Elevations range from 1,200 to over 4,000 feet above sea level. Some areas are very remote. Although it is a working cattle ranch, this area offers the beauty and the danger of the wilderness. There are several gravel roads, and numerous “two track” roads/trails that traverse the countryside, through meadows, up and over mountains, through wooded areas, and along ridges. Along with cattle, there is a wide variety of animals on the property. We hunt the wild hogs, blacktail deer, turkeys, lots of quail and doves, but we also see coyotes, bobcats, raccoons, badgers, skunks and the occasional mountain lion. 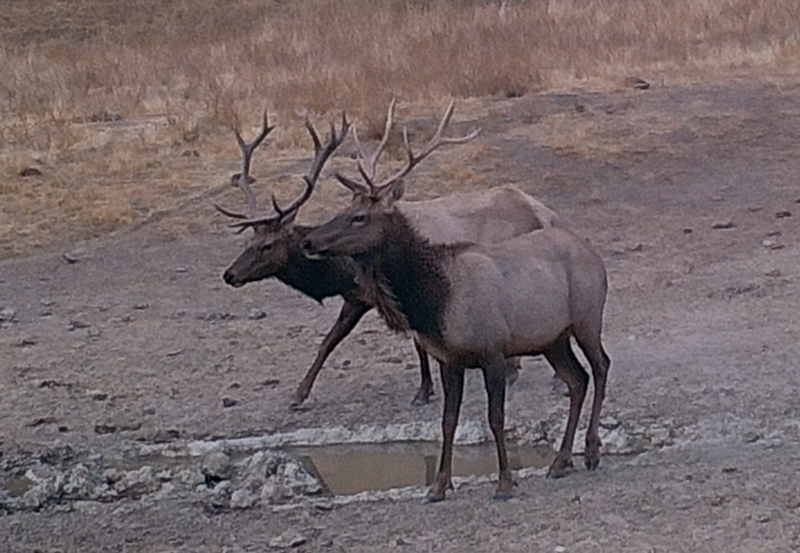 We also sometimes see Tule Elk! There are lots of ground squirrels, cottontail bunnies and hares, and a few badgers. Rattlesnakes are around too, as are some other snakes that are not dangerous. The wild boar include some actual imported Eurasian Wild Boar (Sus Scrofa), as well as some with more domestic feral hog genes. The pigs with more genes of the Eurasian boar are typically black in color and have larger heads and massive front shoulders. The animals with more domestic genes tend to have longer bodies and rounder butts, and be off color or calico, with patches of black, brown, white, cinnamon, and every imaginable combo of colors. We have seen the boars run, stand, fight, mate, and charge. Both male boar hogs and sows can and do charge. Raccoon sightings are rare, but we have seen several. In the skies are all manner of raptors; hawks, eagles, owls, as well as turkey vultures. I have never seen one in 18 years but I hear that some may have seen the rare California Condor. We also see lots of quail, doves, crows and the occasional road runner. Check out the bobcat in a tree. It let me get close and take the photo, I had to do it. We see a fair number of bobcats. They tend to be where we also see the turkeys, quail, bunnies… It is how that works. These four trophy toms were all trying to romance the same solo hen. 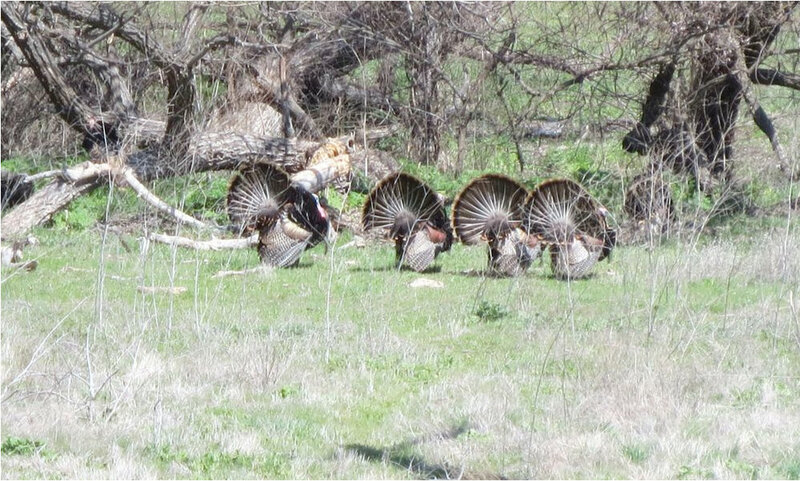 It is interesting that the toms are often in groups despite being fierce competitors. Turkeys do tend to be very communal animals. One reason the toot toot call for turkeys works is because it is like a hen saying “I’m here where are you?” They tend to instinctively move toward the sound. They are habitual too in that they are always within the same general areas. They have their places and that is where they are year after year. They will stay within one or two thousand yards and that is where they live. We often see a particular group of toms we call “the bachelor herd” and they have been around for years. They must forgive each other once the pecking order is established. The boars are frequently seen in the midst of a vast open meadows, but deer are usually where there is some cover. They have patterns, too, as they are more likely to be found in some places than others. That said, sometimes they walk from one “good” spot to another and you can see them anywhere. It is interesting that most of the deer are not out at first light, and most are generally active all day. That said, two of biggest bucks I have seen were at 1am in the headlights and mid afternoon standing under a tree. You just never know. 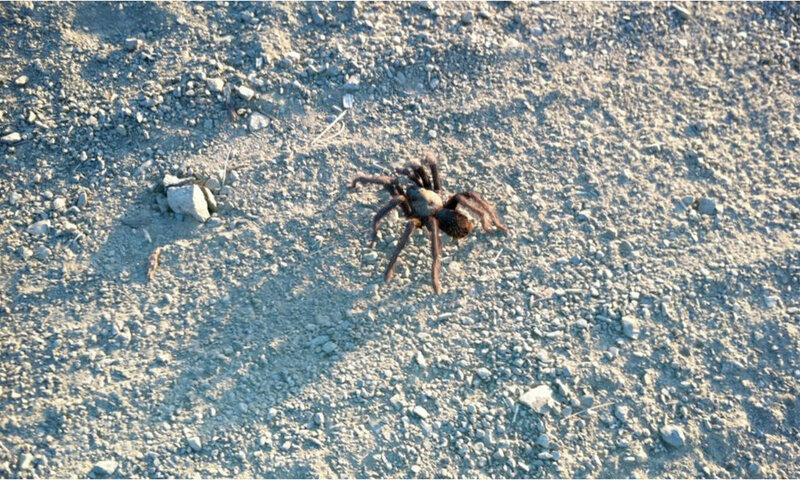 There are even tarantulas sometimes, mostly in the fall and rarely any other time. It is really cool to see some of the bugs that come out late at night. Copyright © 2018 Diablo Boar Guide Service - All Rights Reserved.